Congratulations to the InsuranceNewsNet Five-Star Marketing Team for their honorable mention in the min Integrated Marketing Awards program! 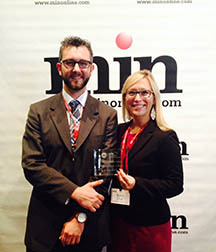 Here are Jake Haas, creative director, and Katie Hyp, director of marketing, at the award ceremony in New York. We are honored to have our marketing team included among the list of finalists representing such well-known publications as The Atlantic, Martha Stewart Living, Meredith Food & Fitness and Women's Health Magazine. We were the only business-to-business publication named as a finalist in that prestigious category.